As Hellboy prepares to stop a powerful and ancient sorceress seeking to destroy all of mankind in the latest Hellboy movie, we thought we’d give the comic book character a hand. Literally. 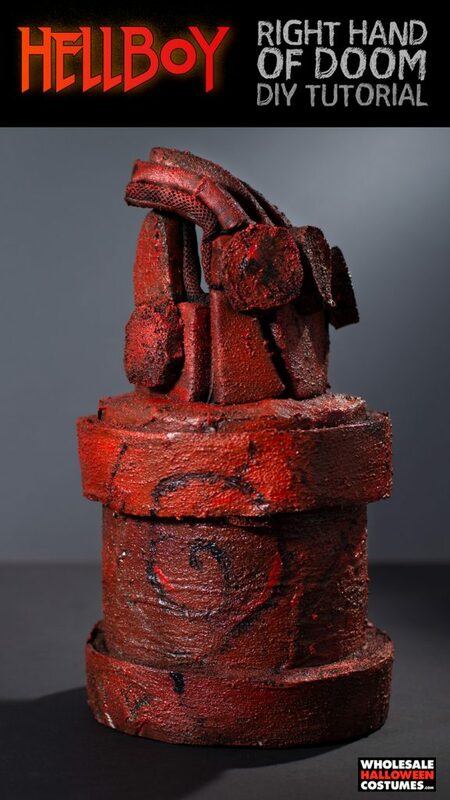 Hellboy is a Dark Horse comic book superhero whose story has been adapted into a movie twice before. In 2004, Hellboy premiered to be followed up in 2008 by Hellboy II: The Golden Army. These films were written by Guillermo Del Toro and starred Ron Perlman as the title hero. Hellboy III: Dark Worlds was announced but later canceled due to funding issues but a reboot was promised to fans in the future. When Del Toro wasn’t offered to write and direct the reboot, Perlman declined to reprise his role. Instead, Neil Marshall is at the helm of the production and David Harbour takes on the mantle of Hellboy. Hellboy is a striking character no matter how you look at him. 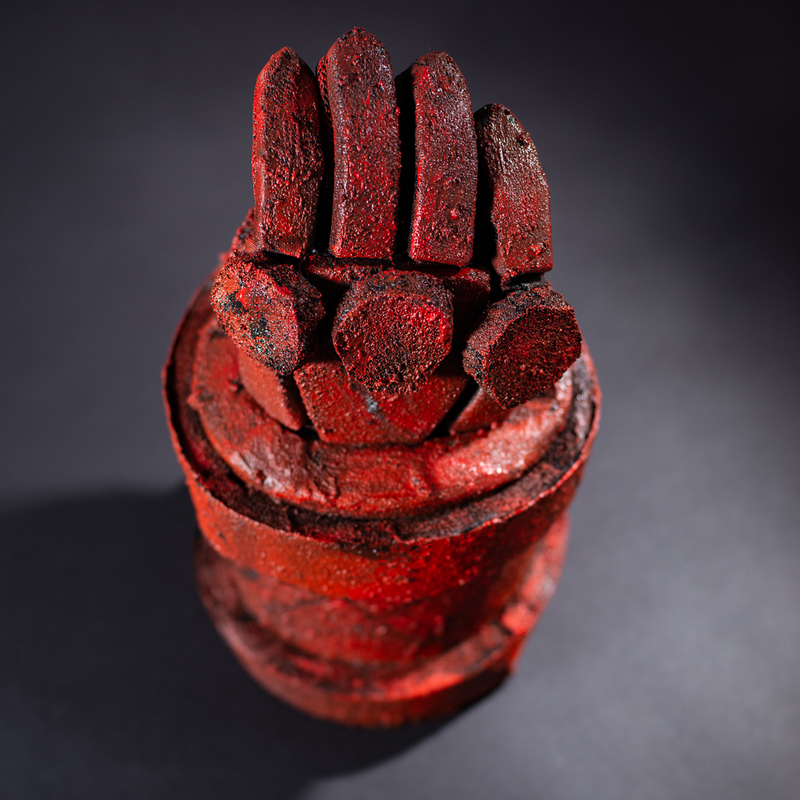 But nothing is more recognizable than his Right Hand of Doom, which was given to him by his father Azzeal shortly after his birth. 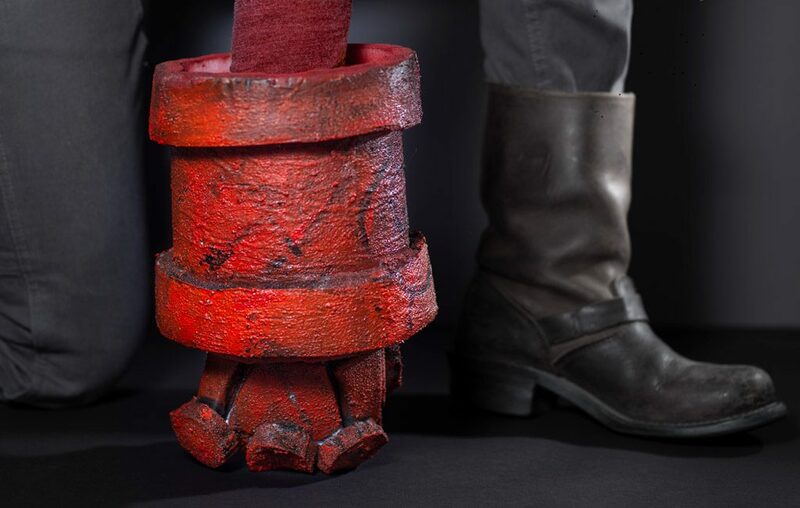 So if you’re dressing up as Hellboy for the reboot or for Halloween, you’re going to need more than a Hellboy costume to make yourself look like the real deal. It’ll take some makeup and a larger than life hand to really transform you. Luckily for you, we created this DIY. 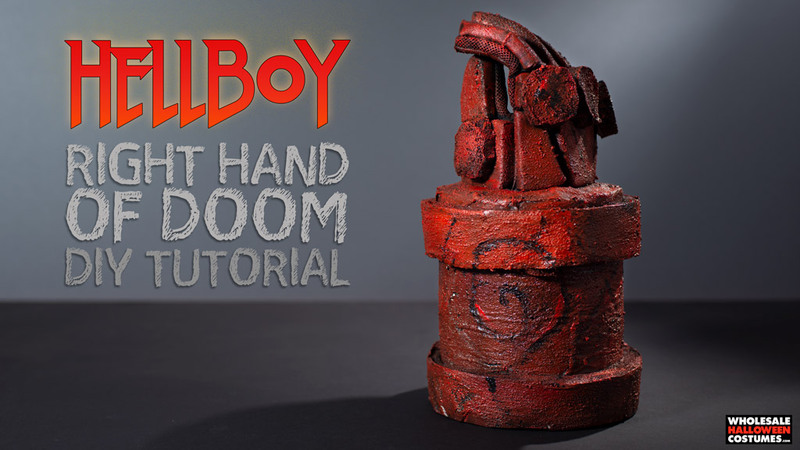 Follow along with the steps below to recreate the Right Hand of Doom to complete your Hellboy look. Step 1. 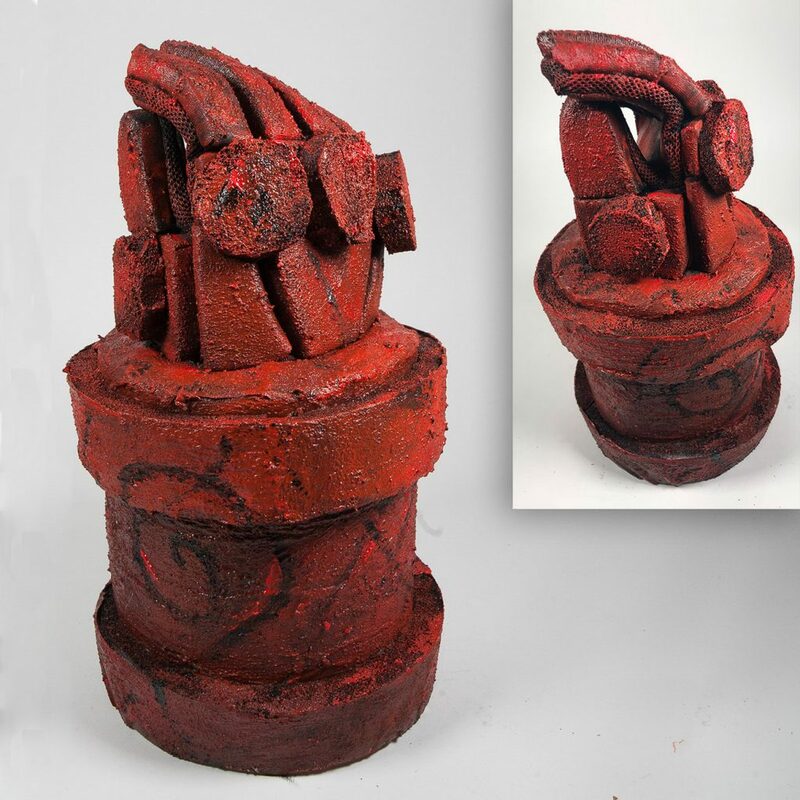 To create the large wrist for the fist of doom, cut a strip of foam 6.5” wide and at least 18” long. 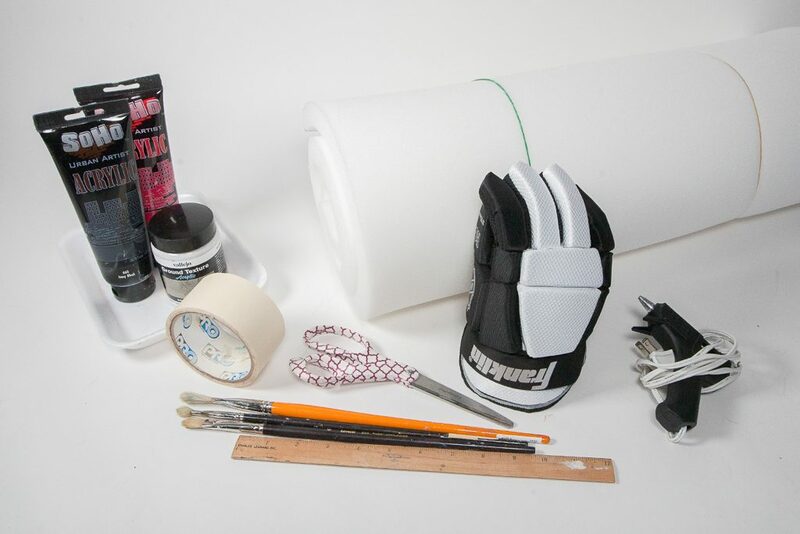 Wrap the foam piece around the base of the glove, and mark where to trim the end. Step 2. 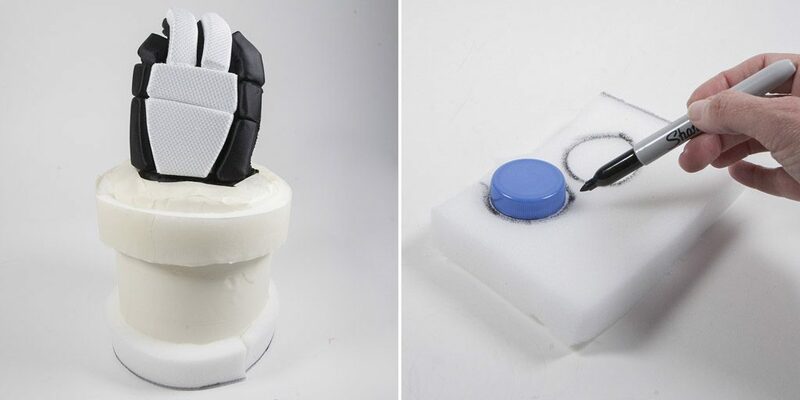 After trimming off the excess, wrap the foam piece back around the glove and use a strip of masking tape to temporarily hold the sides together. Step 3. 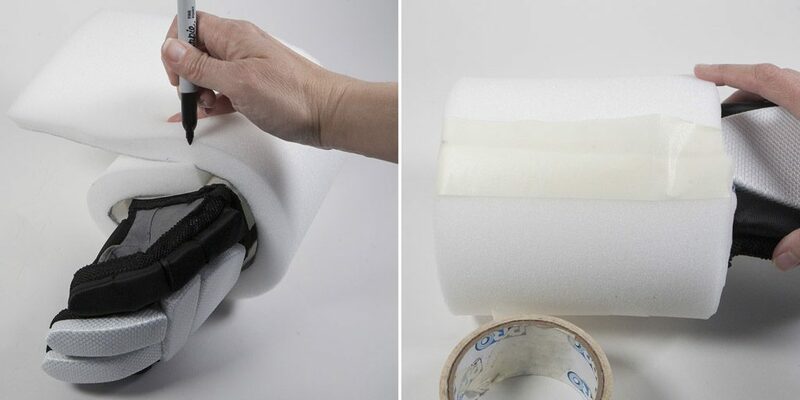 Wrap all of the foam in masking tape, this is to help hold the foam together and also create a surface that is easier to paint. Step 4. 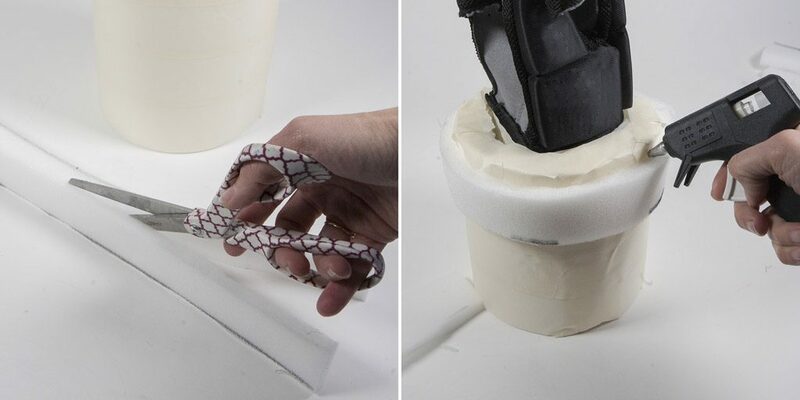 Cut a long strip of foam 1.5” wide and long enough to wrap around the wrist. Step 5. Split the strip of foam in half lengthwise, as shown. This will create 2 pieces that are 1.5” wide and .5” deep. Step 6. Hot Glue the foam strips on around the top and bottom of the wrist. Step 7. 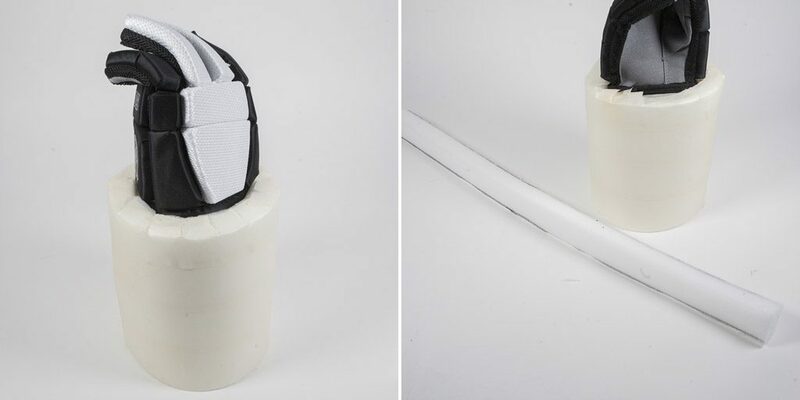 Cover the foam strips in masking tape. Step 8. 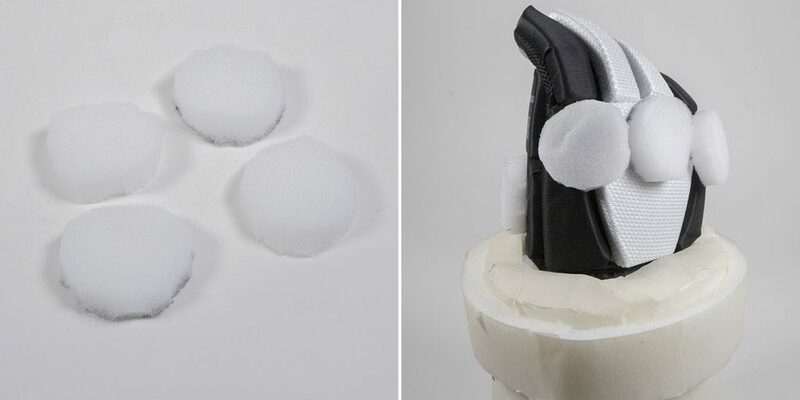 Use a large bottle cap or similar circular item to trace 2 circles on the foam. Step 9. Split the circles in half lengthwise, to create 4 circles that are .5” thick each. Step 10. Hot Glue one circle under the thumb, and the other 3 circles across the knuckles of the glove, as shown. Step 11. Paint the entire fist with the Vajello Ground Texture. Let dry according to the manufacturers instructions, approximately 90 min. Step 12. 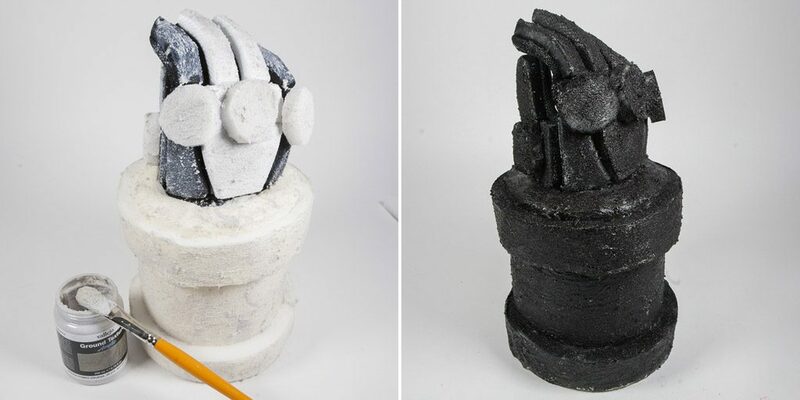 Once dry, paint the entire fist with black acrylic paint. Let dry. Step 13. 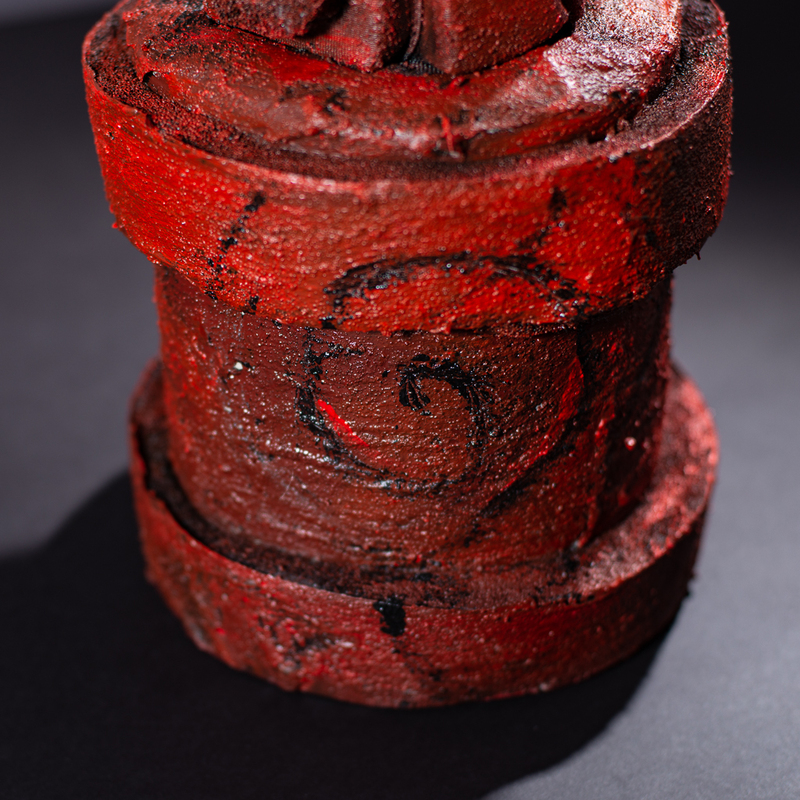 After the black paint is thoroughly dry, start painting the fist red. 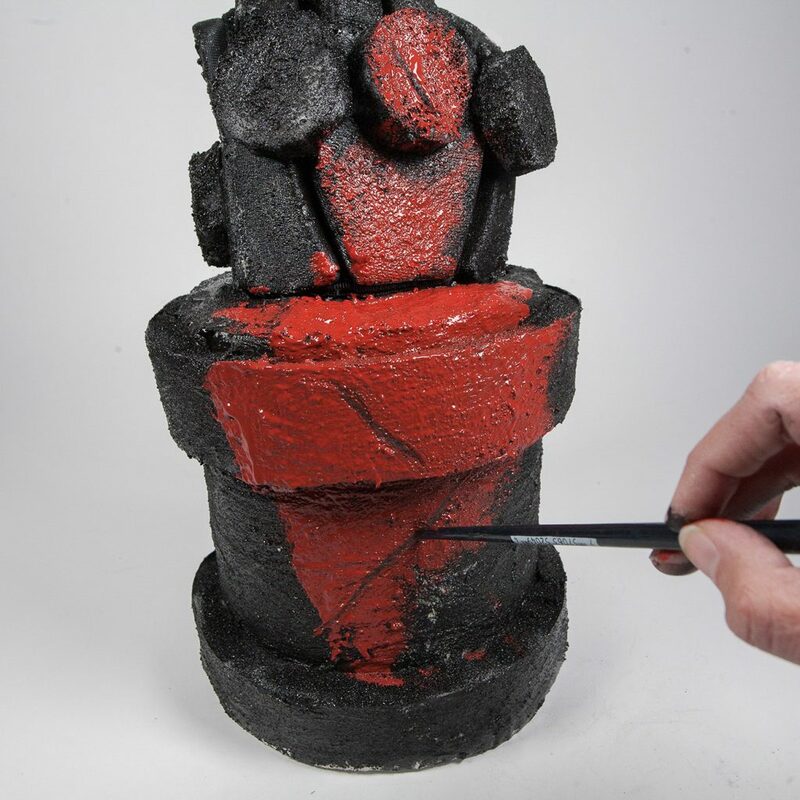 While the red paint is still wet, use the opposite end of the paint brush to “carve” designs and scratches into the fist. Now that you’ve got your costume and your DIY hand, it’s time to put on some makeup. This Hellboy makeup tutorial will help complete the transformation. Stay tuned for more costume DIYs and makeup tutorials. Connect with us on Facebook, Twitter, Instagram or Pinterest to stay up-to-date!